Photo uploading, viewing and sharing is an important activity among Facebook users. For some reason, if you do not like viewing Facebook photos on Facebook website, then here now alternative in the form of Bing website. Now you can view, browse and comment on Facebook photos of your friends, fanpages on Bing.com without having to hop to Facebook website. This is possible using Bing’s new feature “Friends photos”. 1. 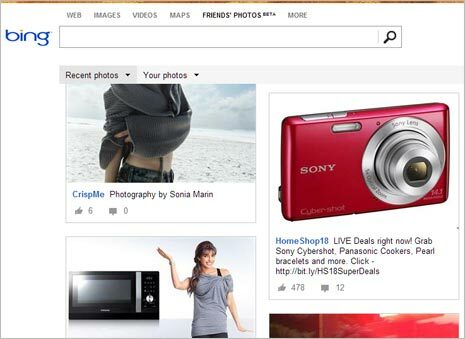 It is easy to get started, just open bing.com/friendsphotos/ website and click Log into Facebook button. Once you authorize app to access your Facebook account information, you are all set. 2. Default page will show latest Facebook photos from your Facebook friends and fanpages. Hover over “Recent photos” option to filter display of photos from only “Friends” or “Fanpages”. 3. Under “Your Photos”, you can filter to view “Photos of you” or “Your albums”. Also you can search for specific friend’s photos by typing his or her name in the search bar at the top. Bing will even show in-line instant suggestions while you type in the search box. 4. Besides viewing photos, you can like, share and comment on photos without leaving Bing website and opening Facebook website. Your actions on photos will be automatically updated on Facebook. Well, there aren’t many compelling reasons for using Bing website instead of Facebook to view, search, comment on Facebook photos. 1. One may be bored of Facebook photo viewing interface and want to try simple, minimalistic photo browsing on Bing website. 2. Bing photo feature can be good refuge when Facebook is blocked. But wonder how you should able to login into Facebook app to authorize for this feature to work – when access to Facebook is blocked! 3. Are you frustrated with Facebook’s timeline layout? You hate Facebook and do not want to open it, but the temptation of viewing photos is too great to resist. Hence, using Bing to view Facebook photos should satisfy all aspects. Above is hypothetical reasoning, in reality there is no solid reason to use this feature. Having said that, simplicity of Bing’s photo browsing is good and you should try this feature once – you might just fall in love or atleast appreciate Bing’s latest endeavour to attract eye balls.